My name is Megan Garrity, also known here in Lima as Greenga. It’s been almost 11 years since I got on a plane and traveled to Lima, Peru. What had begun as a three week work trip turned into more than a decade of adventures! My coined nickname eventually grew into a new way of life as a Business Owner, Gypsy Brewer, BJCP Judge, Pink Booter, VP of the Peruvian Craft Beer Union, and who knows what next! I’m excited to share my story, Craft Beer in Peru, and some of the amazing experiences and people I have met in my travels all over Latin America, representing Peruvian craft beer and as a BJCP Judge. When I arrived in 2008 there were no craft breweries or craft options. In 2010 I came across my first experience with a Peruvian craft beer, an Inti Golden from Sierra Andina. Yes, something that wasn’t an industrial Lager! Soon after I had an American Amber from Barbarian. With that, a light bulb clicked on. These guys were able to brew here, and that meant I could too! I started googling and found a home brew class to get a refresher and access to materials. I could finally brew a beer I wanted to drink! When I started out I had not planned on taking the leap to becoming a professional brewer, but Greenga Brewing was officially launched in May of 2016. Making the decision to go professional was scary. Without easy access to further brewing education, I started to volunteer to brew with my friends in the industry. I worked at a craft beer bar, and listened to consumers., I took BJCP to learn more about off flavors, their causes, and how to prevent them. On the business side, we ran into problem after problem. Our original name was rejected, an investor fell through, and suppliers didn’t have a consistent supply of raw materials. But my nickname Greenga fit perfectly, thus Greenga was born. Barbarian offered their brewery for gypsy brewing. As for sourcing consistent ingredients – I’ve flown from the US with several suitcases full of hops over the years! Brewing in Latin America forces you to think outside of the box and come up with creative solutions since we don’t have easy access to raw materials. I wouldn’t trade it for anything! It’s fun to be a part of this movement where we are basically responsible for forming the craft beer scene while making sure it grows. Craft beer in Peru is brand new; we like to say “esta en pañales” (it’s in diapers). The difference from 2010 when I had my first craft until today, the end of 2018, is exciting to see. We are in a huge growth spurt! Our craft customer four years ago would request one of two things, the lightest beer most similar to a Pilsen (local industrial lager), or the one with the highest ABV. All the professional brewers and homebrewers have worked hard to educate our customers, bars, restaurants, and even bloggers so they better understand what they are drinking. Craft beer can now be found all over the country (not just in metropolitan centers), and we are becoming an important part of the gastronomy that Peru is well known for. Today you can find 40+ professional breweries producing more than 1000lt monthly, 100+ members in the Homebrew Club, and more than 100 bars and restaurants that solely sell craft beer. We have been able to start brewing outside the standard of Blonde/Pale Ale, Red Ale, and IPA. We get to do some fun things and our customers are excited and receptive (although we may still be a few years away from them accepting sour beers)! The market has grown enough that we just held our 3rd Peru competition with 240 entries! My main goal when I studied to be a BJCP Judge was to improve as a brewer, I had no idea how much the world would open up! I met brewers from all over the world, one in particular from the U.S. who asked me if I was in the Pink Boots Society. Since I don’t live in the US, I didn’t know who/what Pink Boots was or represented. As soon at that first competition was over I immediately read everything about Pink Boots and signed up as a member. 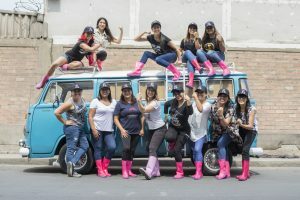 It was inspiring to find this community, and I wanted to bring this feeling to the amazing women I know here in Peru as well as across Latin America. In 2018 PBS-Peru was launched and we have some very talented members. It’s impossible to list all their amazing skills and accomplishments but it’s safe to say women are a driving force in the growth of Craft in Peru. In traveling as a judge, I have met and become great friends with incredible and talented women from all over. I was able to brew with “Ceva das Minas”, the women’s brew group from Porto Allegre in November. The presence and support for women in the brew industry in Brazil is inspiring. I also met and brewed with the founding members of Las Birreras, from Argentina, who have most recently brewed a collaboration beer with the proceeds going to end violence against women. In July we held our 2nd women’s collaboration in Quito, Ecuador, and as a result the Brewsters EC was formed. 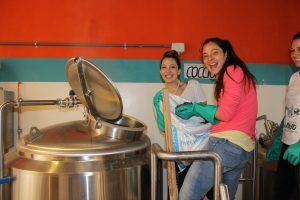 There are also the incredible women in Costa Rica who consistently collaborate and brew together. We have a lot to offer, and from what I have seen the presence of women in beer will only continue to grow here. Peru has presented me with the opportunity to enter into the brewing industry in a way I would have never experienced anywhere else. I am excited to see where our industry will grow from here as well as the rest of Latin America. It hasn’t been the easiest path; living in another country, in another culture, and in general being away from everything familiar. I wouldn’t change anything, and I’m looking forward to the future! Megan is the founder and head brewer of Greenga Brewing (est 2016) located in Lima, peru. 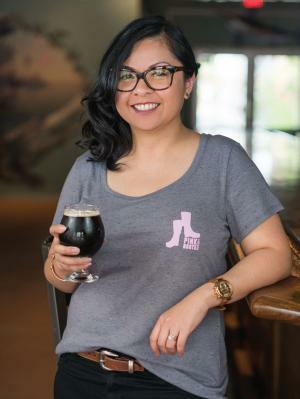 She has travelled as a certified bjcp judge to the most prestigious beer competions in Latin America She is the VP of the Union Cerveceros Artesanales Peru and has lead the effort to establish a Pink Boots Peru chapter, bringing together the top female Brewers in the nation. Finally, she serves as the representative of the Communcation for Bloque Cervecero Latino America. FEMALE BREW FEST® is a craft beer festival featuring female beer experts and brewsters in the brewing industry. Our 2nd annual FemAle Brew Fest takes place March 24th in Fort Lauderdale. The festival offers an opportunity for attendees to interact with the beer experts and learn about the different types of beers brewed by them. The goal for FemAle is not to only highlight these amazing women, but to also use it as a platform to let their stories be heard. The festival is also a way to showcase local female business owners, female led bands and our resident female DJ all while celebrating the growing number of women that make and enjoy craft beer. A portion of the proceeds from FemAle is donated to the PBS. In our inaugural year and the first time doing an event of this magnitude, I didn’t know what to expect. 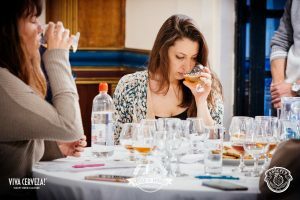 Would anyone come to a female-focused beer event? 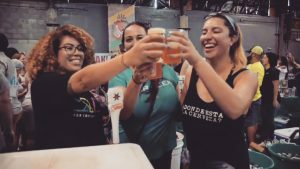 How many women are really involved in the business and would they be willing to come down to Fort Lauderdale and showcase some of the beers they help create? As I began to do research and work with my internal marketing team (a.k.a. my husband) to send out press releases about “South Florida’s first ever beer festival celebrating women in the Industry” my questions were answered not just by the 18 breweries that signed up to participate but also be the myriad of news outlets like Craftbeer.com | FOOD & WINE | WOB | Deco Drive | Telemundo 51 | SouthFlorida.com that wrote, covered and reposted information about the festival. Attempting to produce an event of this size was not easy and our first year was definitely challenging, but all the women I’ve met and things I have learned on this journey has been worth every minute of it. I’d like to take a moment to share some of the things that I learned along the way of planning FemAle. Set a budget and keep it. It’s an amazing thing to be able to produce something that you are so passionate about BUT it is a very scary thing not having any financial backing and not knowing how people will receive your event. Stay organized and create a timeline. There are alot of moving parts that go into running a festival and if possible, build a team to help you stay organized and on track. Personalize it. For example, I cover hotel accomodation for the brewsters and take them out on a beer tour of Fort Lauderdale-based breweries on the Friday before the festival so that we can all get to know each other, share stories, exchange numbers and develop friendships. This festival is as much about supporting and promoting incredible women as it is about drinking some amazing beer, but incredibly rewarding as a beer drinker and women empowerment advocate. Get the word out .I’ve never been one to be in the spotlight, its a work in progress. Producing this event has helped me get out of my shell and comfort zone. Don’t be afraid of sounding like a broken record. Talk to everyone and anyone about your event. You never know who you will meet. And don’t forget to share on social media. Build the right partnerships. Monetary sponsorships are great, but In-Kind sponsorships/partnerships can also be a good leg up. All of my sponsorships last year were In-Kind. I was able to get discounted rates on the venue/services, small bites provided for the VIP area, exposure from partners sharing the event to their list of followers, and giveaways for attendees. Most importantly, do something that you are passionate about. All of the feedback has not been positive about FemAle. Some people were quick to judge the event due to the name and focus. But it is important not to let those things deter you from what you believe in. As an entrepreneur and longtime craft beer drinker, I am always on the lookout for avenues to promote and showcase women. Through my love of beer and passion to be able to empower other women, FemAle was “born”. Going into our 2nd year, the festival has outgrown its original location in FATVillage and will be moving to Huizenga Plaza – a 1.8 acre park with an amphitheater located in the heart of downtown Fort Lauderdale. We’re now up to almost 30 breweries and will be featuring some brewery collaborations including some special releases, including the Boss Bird Hazy Session IPA (got to help with this one) brewed at Swamp Head Brewery for a PBS Collaboration Brew Day and a special brew collaboration from the ladies of Santa Cruz Mountain Brewing and other female brewers in their county. We’ve also started to get some coverage from some our favorite media outlets and excited to see what the 2018 festival will bring. I would like to thank the ladies of the PBS for your continued support and for giving me the opportunity to share this post. Shortly after FemAle last year, I became a member of the Pink Boots Society and I’m honored to be a part of such an amazing organization. Everyone that I’ve had the pleasure of interacting with has been so supportive and willing to help in any way that they can. And on February 23rd, I had the opportunity to participate in my first Collaboration Brew Day at Swamp Head Brewery and will be attending another Collaboration Brew Day on March 8th. I look forward to continuing to build friendships and learning from all you and to further that I’d like to extend an invite to all of the PBS members to check out FemAle 2018. Message me if you’d like a complimentary ticket to attend the event. In return, I would ask for you to provide a donation to PBS when registering for your ticket. Hope to see you all at FemAle 2018!